When I started the Goes Well With Coffee series I knew there had to be at least one ice cream recipe. For affogato. One of my favourite desserts. Nothing more than a delicious scoop of your favourite ice cream (ideally something neutral like vanilla but pistachio or roast almond work well too), drowned (affogato) in a shot of bitter espresso. The espresso cools down almost immediately as the ice cream starts melting. And while not exactly a pretty dessert, I love the contrast between the unsweetened and bitter still warm espresso and the cold, sweet and creamy ice cream. If you follow me on instagram, you will have noticed that my feed is looking decidedly brown-ish these last few weeks with photo after photo of baked sourdough loaves, dough sitting in proving baskets and bags of flour from my favourite organic mill here in Belgium. I bought the third Tartine book for myself when I still lived in Rome. But the impending move to Brussels and getting settled here meant it took me almost a year to really start using it. And using it I most certainly am right now – following the mantra practice makes perfect, I am currently baking as many loaves as I can (which, given my work and travel schedule is about 4 times a month), taking notes of the process, watching endless videos on youtube on how to handle the high hydration dough Tartine is so famous for and slowly starting to tweak the process to my own liking. And while that perfect oven spring, the big holes and a soft and custardy crumb at times still elude me, I haven’t bought any bread since starting this endeavour so there is that. Baking bread this frequently when I often find myself eating breakfast, lunch and dinner at my desk at work means I invariably have surplus bread. I have taken loaves to parties, travelled with them to Italy to share with Alessandro and his family, given them to friends and colleagues and my freezer is full to bursting with carefully wrapped loaves. And yet I invariably find myself with bread going stale every once in a while. While sourdough toasts up beautifully and makes delicious breadcrumbs, ever since the toasted breadcrumb dacquoise I made years ago, I was keen to try using sourdough bread in more sweet applications. 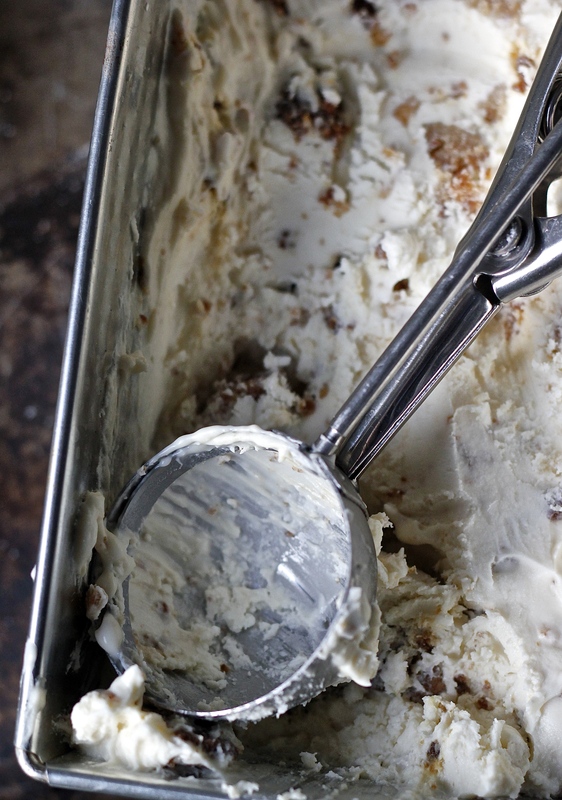 Using bread in ice cream is nothing new – there is after all the classic English recipe of brown bread ice cream. This is not dissimilar although even nicer in flavour if you ask me. Stale sourdough gets torn into small crumbs that are tossed in melted butter, sugar and sea salt and caramelised in the oven. These are then folded into a custard-based ice cream that gets a little bit of extra tang from creme fraiche (to mimic the slight acidity of the sourdough). And while delicious on its own, this ice cream is even better topped with a shot of your favourite espresso. Note: I am just going to say it: you should make a double, scrap that, a triple batch of the caramelised sourdough crumbs. They are as addictive as kettle corn (if not more so) and you will find yourself grabbing a handful every time you step into the kitchen. So do yourself a flavour and make plenty – set aside 2-3 generous handfuls to stir into the ice cream once it is almost done churning and keep the rest for snacking. As for the ice cream, I tried infusing milk and cream with toasted sourdough (too much hassle and not a strong enough flavour to make it worth it), a cream cheese based recipe (the texture was all off), a mascarpone based recipe (funny mouthfeel) but in the end settled on a classic vanilla-flavoured custard. The one change I made was to lighten the custard with creme fraiche – this adds a nice little tang which mimics the slight acidity of the sourdough bread. Start by preparing the caramelised sourdough crumbs. Pre-heat the oven to 200 degrees Celsius and line a sheet pan with parchment paper. In a bowl mix together the sourdough crumbs with the melted butter, sugar and salt. Spread on the sheet pan and bake for 20 minutes, stirring every 5-10 minutes until the bread is nicely coloured and fragrant. Set aside to cool. To make the ice cream, heat the milk together with the vanilla bean until steaming point in a large sauce pan. While the milk is heating up whisk the egg yolks with the sugar in a separate bowl. Slowly pour about a third of the steaming milk into the egg yolks, whisking constantly. This will temper the egg yolks and stop them from curdling. Turn the heat down to low-medium and pour the egg yolk milk mixture back into the sauce pan with the rest of the milk. Discard the vanilla bean. Stirring constantly, cook the custard until it thickens enough to coat the back of a spoon. Strain the custard into a bowl and set aside to cool. Stir in the creme fraiche and churn according to the instructions of your ice cream maker. Alternatively, pour into a container with a lid and place in the freezer for 6 hours, whisking thoroughly every 30 minutes to 1 hour to prevent large ice crystals from forming. Once the ice cream is nearly done (it should be very thick but you should still be able to stir it), fold in the toasted sourdough crumbs. This sounds sooo good Sophia – hope i will be able to give this a try as long alls summer lasts! My Instagram feed is always brown-ish!